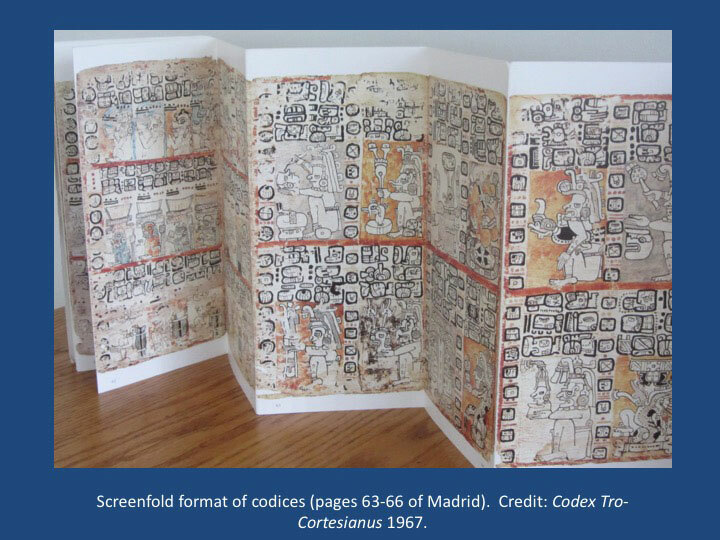 One of the things that captured the attention of the Spanish when they first made contact with Maya cultures is that they had books (called codices). 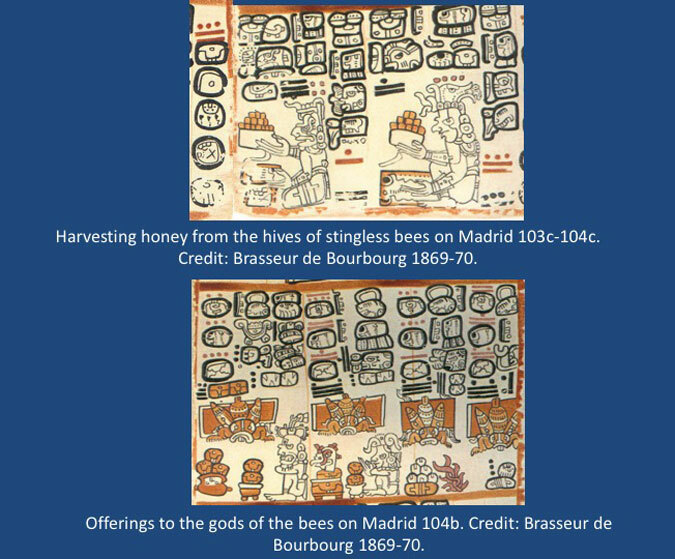 These were written in hieroglyphic texts and painted with images of ceremonies and everyday activities being performed by Maya deities. Some of the activities included planting corn, or maize (Pic 1 top), weaving textiles (Pic 1 bottom), hunting deer and other animals (Pic 2), extracting honey from the hives of native (stingless) bees (Pic 3 top), and making offerings (Pic 3 bottom). Unlike our books, they were made of long sheets of paper that were folded accordion style (we call this “screenfold”; see Pic 4). The paper was made from plant fibers - identified in some cases as the inner bark of the fig tree - and was covered with a white plaster before it was painted. Codices were organized into separate units known as almanacs and tables. These contained calendrical notations that linked the different segments (or frames) of the almanacs and tables together (Pic 5). They were used to schedule certain activities (like those described above), to determine good or bad days for performing these activities, and for charting the movement of the heavenly bodies (in particular, the sun, moon, Venus, Mars, and the stars; Pic 6). While we see these as objects without a life of their own, for the Maya, they were deities whose movements helped determine what would take place on earth. This was based on their observations of these celestial objects as having distinct patterns of movements, some of which could be used to determine the seasons and proved useful for deciding when to plant particular crops, when to harvest them, etc. Codices were made by specially trained scribes who had knowledge of the different calendar cycles. This was gained from years of observing the nighttime sky and recording the positions of the stars and planets. 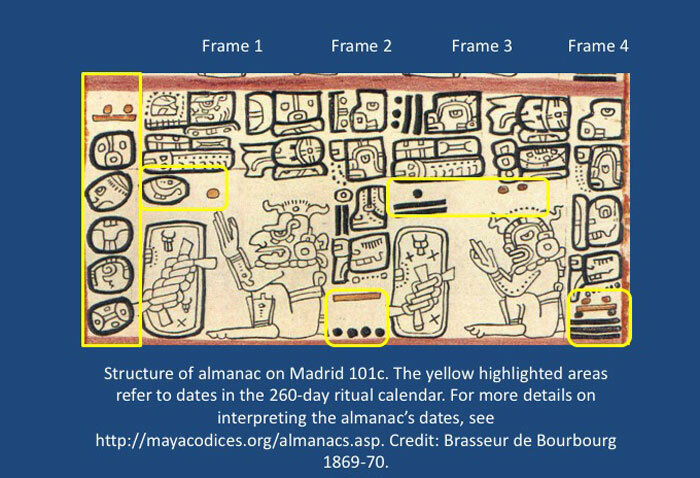 Evidence of this practice has been found at sites such as Xultun in Guatemala, where notations painted on the walls of a structure formed the basis for the types of astronomical computations recorded in codices. Because of the knowledge they contained, codices were considered sacred and could only be handled and interpreted by certain people who had the necessary skills and position in society. They were most likely kept in a special place (perhaps a wooden chest) for much of the time and taken out when they were needed for making predictions and scheduling important events. 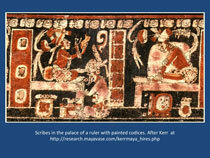 We know that this sometimes took place in the palaces of rulers based on scenes painted on Maya pottery vessels (Pic 7). 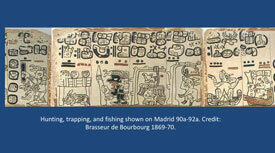 Unfortunately, only four Maya codices are known to exist today. Three are in European collections and are named for the city where they are preserved – the Dresden, Madrid, and Paris codices. We have no specific information about how they got from the Maya area (specifically, from the northern region) to Europe, although we do know that some of the Spanish friars and explorers sent “curiosities” home, and codices might have been included in these (Pic 8). 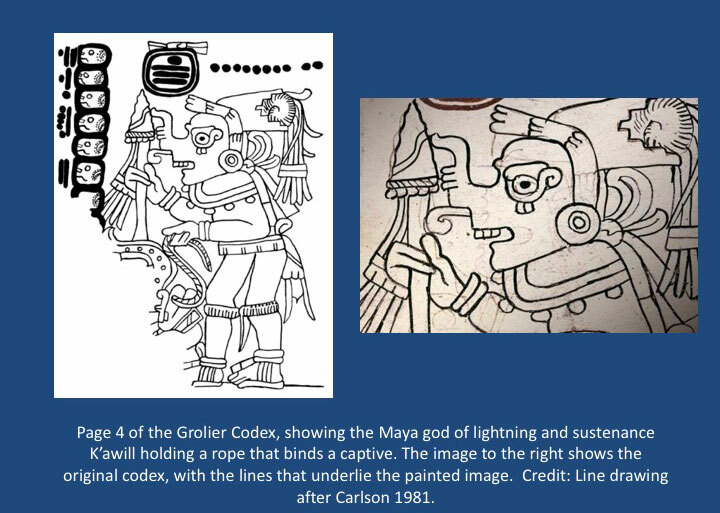 The fourth codex, originally called the Grolier but recently renamed the Códice maya de México (Maya Codex of Mexico), has a very different history. It was reported to have been discovered in the 1960s in a cave in a mountainous part of the Maya area (Chiapas), along with some blank pieces of fig-bark paper. 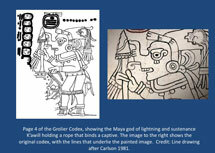 Its style is very different than that of the other codices (Pic 9), and experts spent many years debating whether it was a codex that was hidden away sometime before the Spanish reached the area, or whether it was painted more recently (in the 20th century) to resemble a codex from the prehispanic tradition (i.e., prior to the conquest). 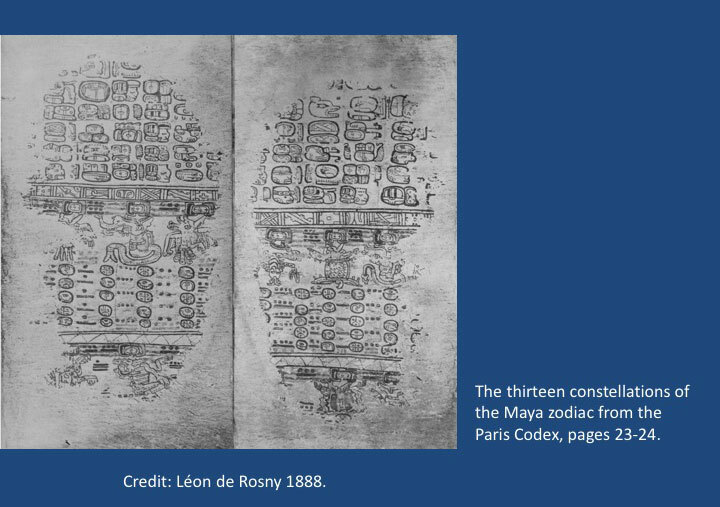 This debate has finally been settled, with a conference held in Mexico City in September 2018, where experts reported the results of scientific studies showing that the codex must have been painted prior to the Spanish Conquest. Studies of the age of the paper on which it is painted suggest a date in the 11th or early 12th century. How long it was kept in the cave remains unknown. 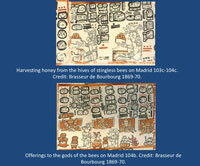 The codex is part of the collection of the National Library in Mexico City. 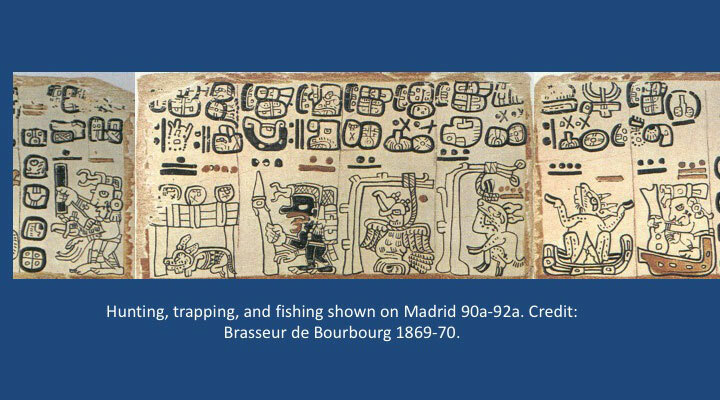 The other three codices were probably still being used when the Spanish gained control over the Maya area in the mid-16th century. A study of them shows us, however, that many of the almanacs and tables that they contain are copies of much older ones, dating back to the Late and Terminal Classic periods (Pic 10). Tables such as these may have had historical significance, which is why it was important for scribes to copy them and pass the information along, although they were also updated so that they were relevant for the people using the codices in the century or so before the Spanish Conquest. This was the case with the eclipse table, which was originally intended for use in the 8th century. Its preface, however, contains information allowing it to be reused for another millennium beyond that, so it may have been used up to - and even after - the arrival of the Spanish. 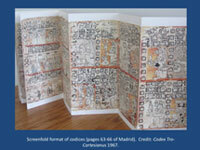 The Madrid is the longest of the three codices, with a total of 112 pages (56 painted on both sides). Its pages are also larger than those of the other codices. It includes a great deal of the color “Maya blue,” which was made from a mineral known to occur near the site of Mayapán in the northern Maya area (Pic 11). Because of this, researchers have suggested that it may have been painted at Mayapán. 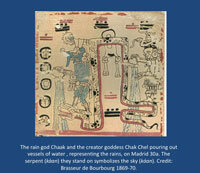 Its almanacs show the greatest variety in terms of subjects, with many focusing on the rain god Chaak and the god of maize (Pic 12). 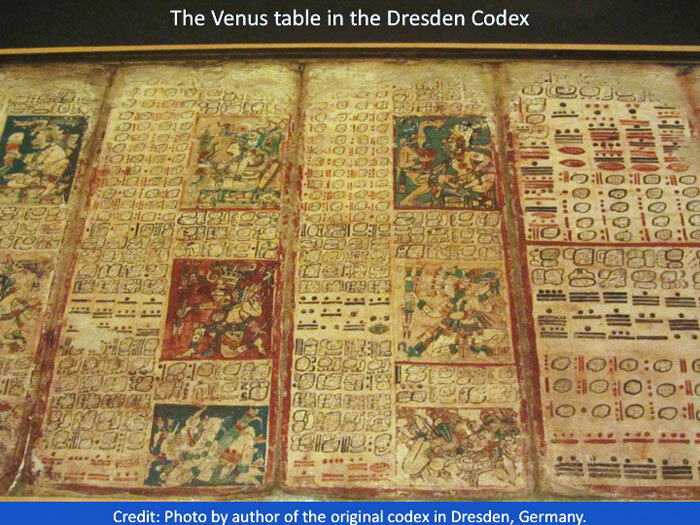 The Dresden Codex has 78 pages, although four of them were not painted. It was damaged during World War II, so photographs taken very early on (in the 1880s) are important for showing what it looked like prior to the damage. 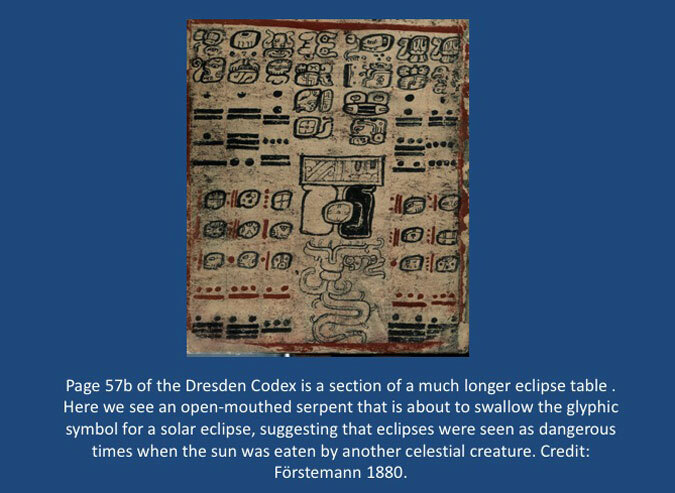 About a third of the Dresden Codex is focused on astronomical subjects, including Venus’ cycle in the nighttime sky and determining dates for solar eclipses (see Pics 6 and 10). 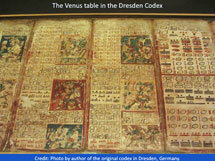 The codex is on display in a special room in the Saxon State and University Library in Dresden. 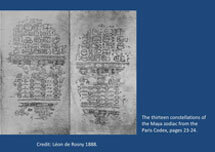 The Paris Codex is probably only a fragment of what was once a longer codex. It has 22 pages, which are only partially preserved. Its texts are similar to ones written during the Classic period, and it emphasizes the god K’awiil, who was associated with Maya rulers. 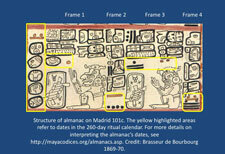 It also includes a table that shows the thirteen constellations of the Maya zodiac (see Pic 8). Several are eroded, but reading from right to left in the upper set, we see a rattlesnake, turtle, scorpion, owl, fish-serpent, and unidentified bird. The bottom, from left to right, includes a jaguar, skeleton, two eroded constellations, a bat, frog, and another eroded constellation. Most of them correspond to constellations we are familiar with; for example, the turtle is in the same place in the sky as Orion, the scorpion as Scorpio, and the owl as Gemini. 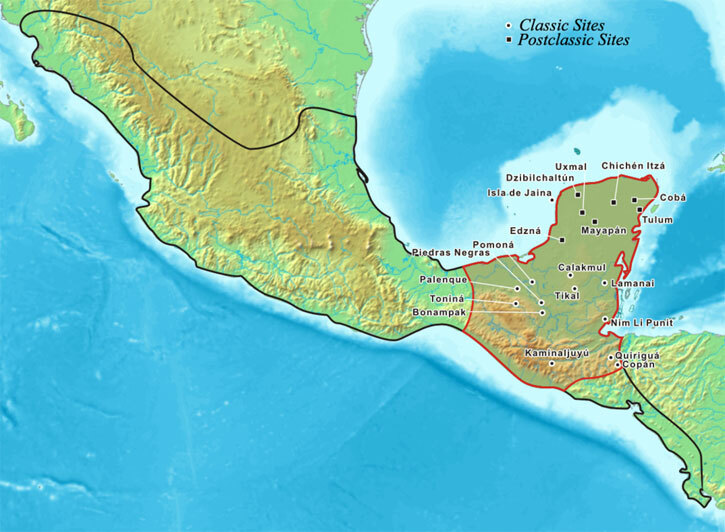 After the Spanish settled the Maya area, friars based there worked hard to prevent scribes from painting new codices or from using the ones they had in an effort to destroy all traces of the prehispanic religion. Any of these manuscripts discovered were confiscated by the Spanish and were afterwards burned, sent to Europe, or eventually lost. The four that remain today give us an important window onto the rituals and everyday lives of Maya people at the time just before their lives were changed forever by the arrival of the Spanish. • Brasseur de Bourbourg, Charles E.
1888 Codex Peresianus. Manuscrit hiératique des anciens Indiens de l’Amérique Centrale, conservé a la Biblithèque Nationale de Paris. Bureau de la Société Américane, Paris. • Picture 11 from Wikipedia (List of Maya sites). 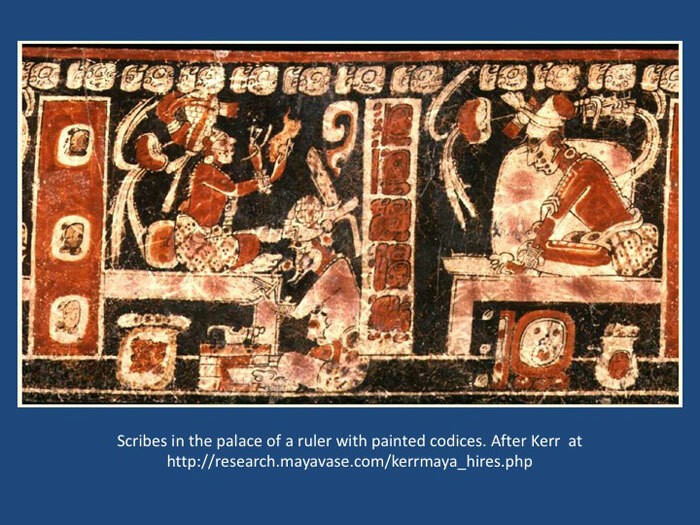 Visit the website mayacodices.org (link below) to learn more about the types of information Maya scribes considered important to include in codices. In the search box on the site’s home page, try typing in words like ‘jaguar’, ‘eclipse’, or ‘Chaak’ to see what else you can learn. Q. 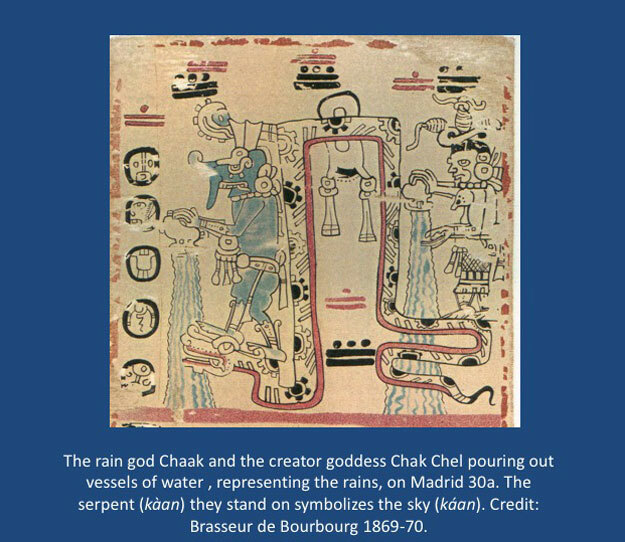 What common English phrase was inspired by the Maya rain god?